HARLEM — After reclaiming a student-run community room and turning it into a career services center, City College is offering students upset with the move a new space with double the square footage. The school is offering students a former firehouse on 140th Street between Convent and Amsterdam avenues, City College officials said during a meeting Thursday on campus with the City Council's Higher Education Committee, which included a tour of various existing spaces for students. "The space we are offering is double this size," John Kotowski, director of city relations for City College, said while standing in the former Guillermo Morales/Assata Shakur Student and Community Center on the third floor of the North Academic Center at 138th Street and Convent Avenue. But student leaders and Councilman Ydanis Rodriguez, chair of the committee, said they wanted the Morales/Shakur space returned to students partly because of its symbolic value. The space has already been transformed with new floors, furniture and a fresh paint job. "I hope we can keep (the room) as a student community center," said Rodriguez who reminisced about sleeping in the room for weeks at a time during protests in the late 1980s and early 1990s when he was a City College student. The Morales/Shakur Center was given to students following the 1989 protests over tuition hikes. It is named for Morales, a Puerto Rican separatist who lost his fingers and an eye when a bomb he was making exploded, and Shakur, a member of the Black Liberation Army who was formerly known as Joanne Chesimard and was convicted in the 1973 shooting death of a New Jersey state trooper. The college removed a sign with the center's name in 2006 after controversy arose about it. City College officials took over the space without warning early on Sunday, Oct. 20, saying the room was necessary to expand the City College Careers and Professional Development Institute. Student protests over the loss of the room have turned violent with campus police deploying pepper spray and security being pushed to the ground. Student protest leaders Tafadar Sourov, a 19-year-old sophomore, and Khalil Vasquez, a 22-year-old senior, have been suspended from school and are now facing misdemeanor criminal mischief, obstructing governmental administration, inciting to riot and attempted assault and harassment charges for their role in an Oct. 24 protest during which a female campus police officer claims she was pushed to the ground by the pair. A disciplinary hearing at the school was scheduled for Friday morning. Mel Niere, 21, a City College senior and student government president, said students are upset because they feel the college has a history of taking student space without consulting them. City College officials are saying a new community space would be fully programmed, but students want the free-flowing set-up of the old room that allowed dozens of community groups such as a farm share and book sharing program to operate. "The room was a revolutionary room and they want to make it into an institutionalized space," said Niere. "That kind of defeats the purpose." Bronx Councilman Andy King said the historical importance of the room should not be disregarded. "In order for our young people to move forward they have to understand what yesterday is about," he said. 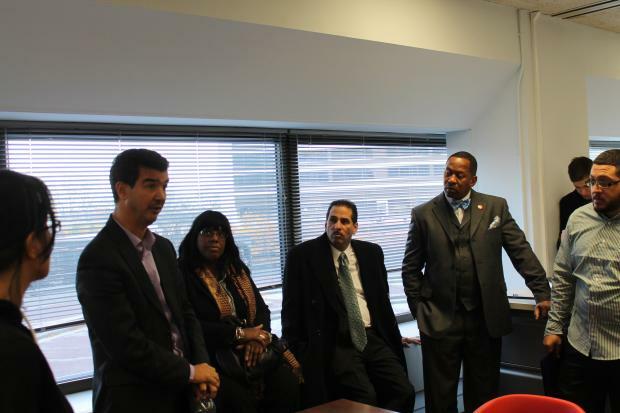 During the tour, City Council members saw the various computer labs, lounges, and state of the art meeting spaces that are available to students. Rodriguez said having as much of that type of space available as possible is especially important to City College students. "This is the real working class. Sometimes they don't have the space to study or meet in their apartments because they are living with five other people," he said. "Hopefully something good can come out of this."